Experiencing false readings from your sensors, or a continuous odor from your black water holding tank ? If so, you most likely have residual waste build up on your holding tank walls and sensor. 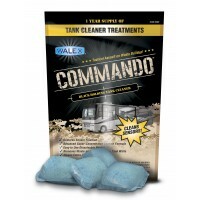 Use Commando Black Water Holding Tank Cleaner to remove the odors and clean the tank in as little as 12 hours. Continued use every 3 months will keep your tank in working order. Instructions: Empty black water holding tank. Drop in one packet of Commando in toilet and flush. Fill holding tank with water until sensors are completely covered. Let product sit in tank for 12 to 24 hours and if possible, move the boat so liquid in tank moves around. One packet will work on tanks up to 50 gallons.